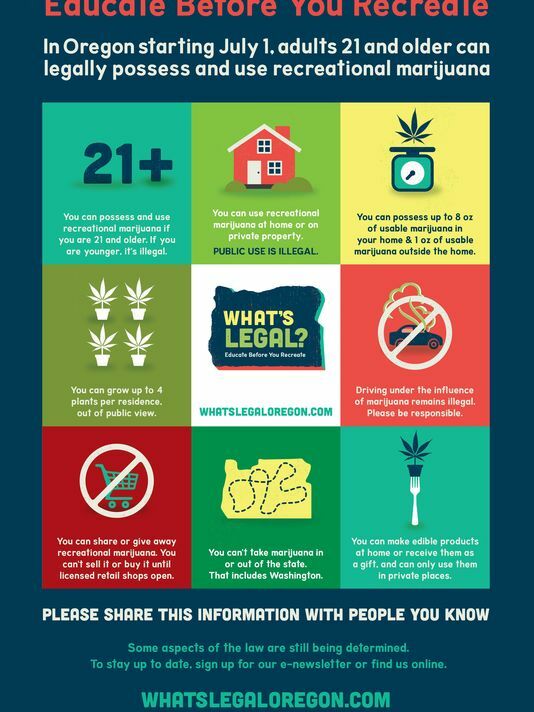 Oregon is rolling out a cannabis information campaign. A: Starting July 1, 2015, Measure 91 allows Oregonians to grow up to four plants on their property, possess up to eight ounces of usable marijuana in their homes and up to one ounce on their person. Recreational marijuana cannot be sold or smoked in public. Until then, current marijuana laws in Oregon remain in place. Measure 91 requires OLCC to begin accepting license applications by January 4, 2016 for commercial growers, processors, wholesalers and retailers. A: Marijuana will be available for purchase through retail stores licensed by the OLCC sometime in the third quarter of 2016. A: The OLCC has made the decision to take extra time to make sure that it gets the availability of edibles and extracts right. They will eventually be available at retail outlets licensed by the OLCC, but probably not at the same time that the stores are expected to open in the third quarter of 2016. A: Beginning July 1, 2015, recreational marijuana users can possess up to eight ounces of useable marijuana and four plants per residence in Oregon. An individual can carry up to one ounce in public, but smoking using marijuana in public is prohibited. A: Yes, with limits. The act allows home grow of up to four plants per residence beginning July 1, 2015, regardless of how many people live in the residence. Four adults in one residence does not mean 16 plants. The limit is four per residence. Q. Can a landlord tell tenants not to grow recreational marijuana or smoke it rental units? A: As of July 1, 2015, anyone 21 years of age and old and consume recreational marijuana in Oregon. 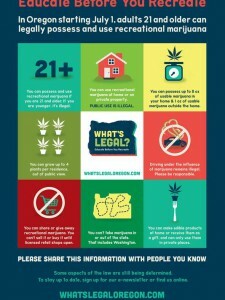 Marijuana use or possession of recreational marijuana by anyone under 21 years of age is illegal. That includes home consumption. A: Yes. Current laws for DUII have not changed. Driving under the influence of intoxicants (DUII) refers to operating a motor vehicle while intoxicated or drugged, including impairment from the use of marijuana. In addition, Measure 91 requires OLCC to examine, research and present a report to the Legislature on driving under the influence of marijuana. The OLCC will do this in conjunction with the Department of Justice Criminal Investigation Division and Oregon State Police. A: Passage of measure 91 does not change existing employment law in Oregon. A: Measure 91 does not address siting requirements. Where to locateLocation of commercial recreational marijuana businesses will be determined by legislative action, location local action or through the OLCC rule-making process. To keep up to date, click here. A: Under the provisions of Measure 91, the OLCC is required to collect the tax on recreational marijuana at the grower level. ← What kind of cannabis lawyer do you need?